I am a sucker for pretty pictures. 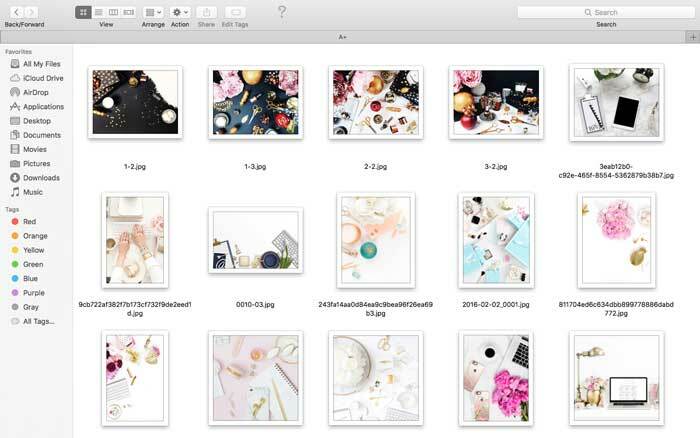 With my close to nonexistent photography skill and the limited resources of pretty things as prop, I must thank every blogger I came across who offers free stock photos when I subscribe to their newsletter. Getting emails every month with free stock photos? Erin approves! Before you start asking where I get them, check out this post where I listed down blogs that offer free stock photos. I will update the list very soon so please keep on the lookout. One more website I love is Creative Market because they offer free fonts, stock photos, clip arts, etcetera for free every week so you’ll get a fresh new batch to download every Monday. Absolutely the highlight of my week! Another way of getting stock photos is through Pinterest. I simple search ‘free stock photos’ and there’s a lot of pins you can choose from. I spent hours going through Pinterest and making sure that I don’t miss any pins because a post missed may contain adorable photos I can use on my blog so I’m not risking it. There are a lot of stock photography websites out there but unfortunately most of the pictures available do not fit my blog look. I’m very fussy so the choice of photos for each of my posts must fit my clean, white blog. I even took the time to revamp my older posts by uploading new photos. 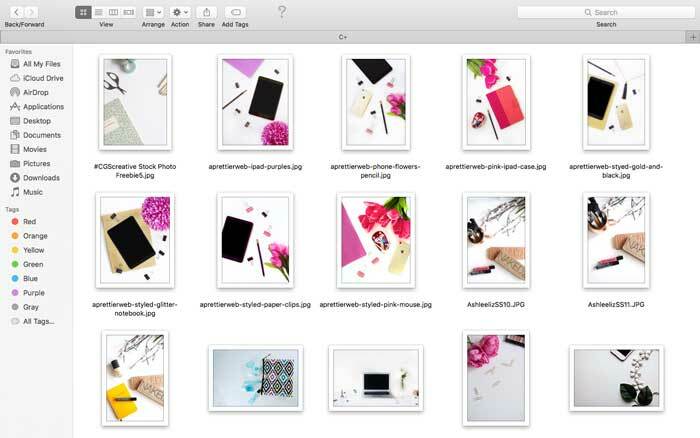 Now I’m going to show you how I organise my stock photos. 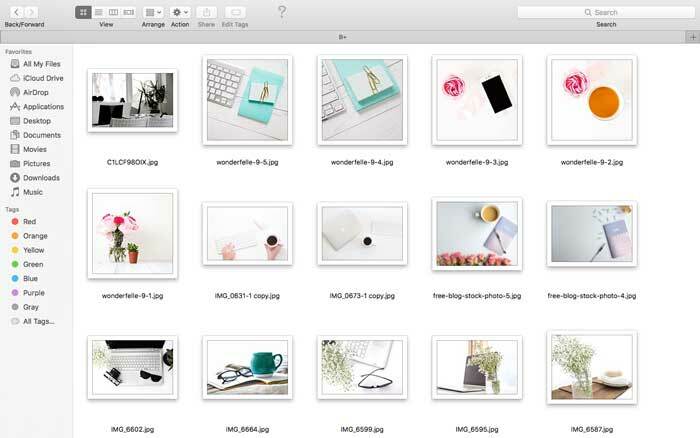 I dedicated a specific folder for my stock photos instead of just keeping them in the ‘Pictures’ tab to make it easier for me to find the photos I want to use for my blog posts. 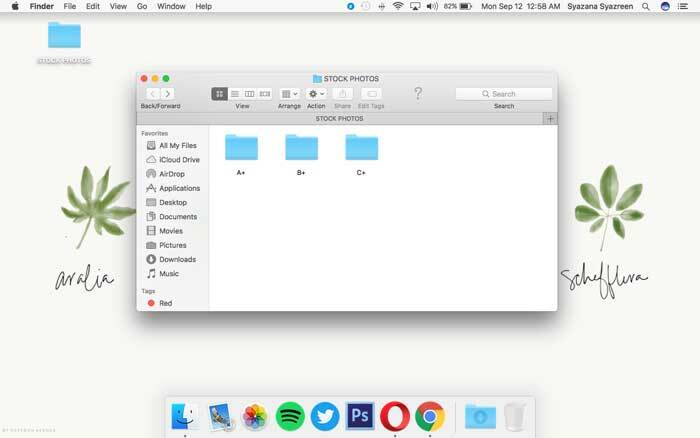 As you can see, I have an almost empty dashboard except for the ‘STOCK PHOTOS‘ folder. I then have 3 subfolders named ‘A+’, ‘B+’, and ‘C+’. Yes, I rate my stock photos so I know what type of photos I want to use. I keep the highest quality photos in the A+ folder. 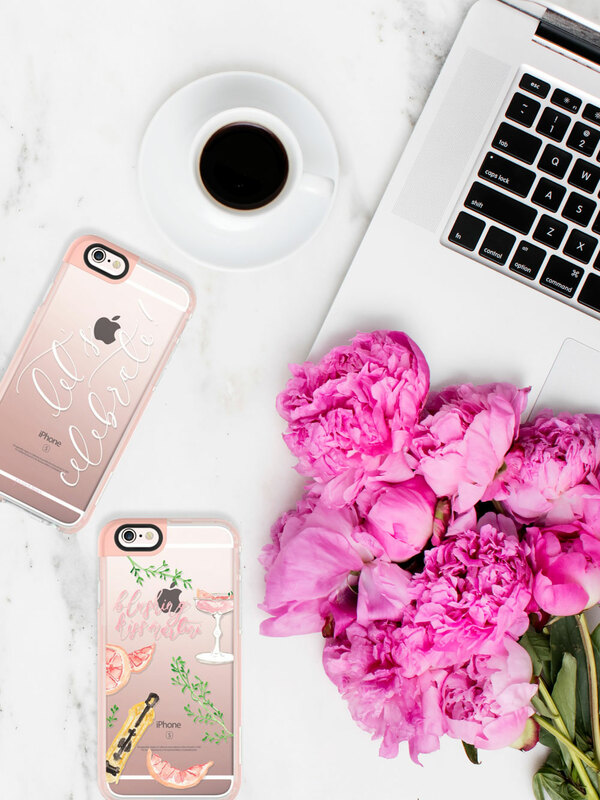 The photos in this folder are feminine with a lot of bling and gold and rose gold and it’s my favourite folder out of all 3 but unfortunately I rarely ever used them for my blog posts because they are so pretty I would rather keep them in my folder. So far I have 130+ photos. My most used folder. Not as high quality as the A+ folder but still cute nonetheless. Most of the photos you see on my blog are from this folder and a lot of them are desk, MacBooks, notebooks, flowers, coffee, and whatnot. So far I have 110+ photos. My least favourite folder of the bunch. I mainly use photos from this folder for my Erin Talks posts. I usually delete photos that I know I won’t use and C+ is kind of my ‘hidup segan mati tak mahu’ and ‘ditelan mati emak, diluah mati bapa’ kinda folder. Deep down, I know they’re going to be a gem one day. So far I have 80+ photos. I can download hundreds of photos at a time so I keep them all in my Download tab before sorting them to specific folder. I got rid of photos that are not up to my expectation and sometimes I can delete the whole folder I just downloaded because I didn’t like any of the pictures. I still keep the photos I’ve used on blog posts just in case I need to use them again in the future. I’ll make sure to change the size of the photos (width=700px) so they’ll appear sharp and crisp on the blog. I hope you enjoyed this post and happy stock photo hunting!